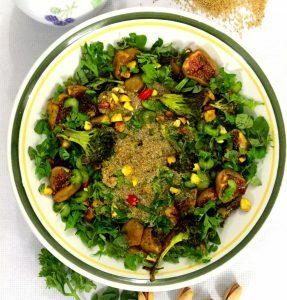 A simple and delicious salad for warm humid days or when you just want a quick light lunch. 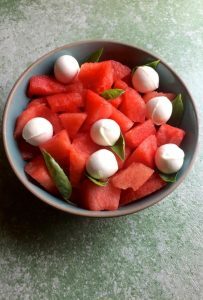 With watermelon of every shape and size available in all their bounty this season, the Watermelon Bocconcini Arugula Salad is easy to put together. 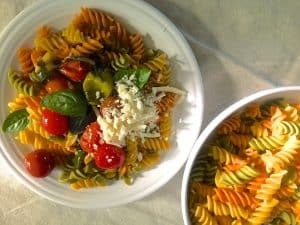 Eye-catching and flavourful cherry and grape tomatoes of different colours and some whole wheat pasta went into this easy and quick Rotini Pasta in Garlicky Burst Cherry Tomato Sauce. The sauce cooks quickly while the rotini is boiling, and the pasta is ready to serve in 15 minutes. Not much chopping and slicing required as the tomatoes are added whole. The cooking times below are assuming that the pasta is set to boil while the sauce is being prepared, and then the cooked pasta is added to the sauce at the end. 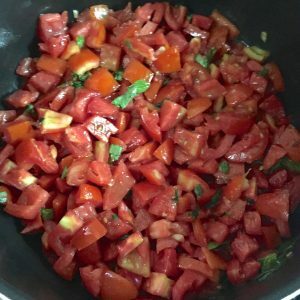 This easy, 6 ingredient (counting salt, pepper and oil, each as ingredients) Tomato Basil Sauce for Pasta or Pizza is a very basic and simple sauce. I make it about once a month and then freeze it in separate small portions so that there is always a little packet of sauce ready whenever I want to make pasta or pizza. You need ripe red tomatoes for a good flavourful tomato basil sauce. I use the zero pesticide San Marzano tomatoes supplied by First Agro Farms, and they give me sauce of just the consistency that I need. The ingredients below give the quantities of fresh basil to be added for the tomato basil sauce, however if dry basil is to be used, please reduce the quantity by half. There is very little seasoning in the sauce, so depending on what pasta and other ingredients or which pizza you are going to make, the seasoning can be adjusted at that time. Similarly, sliced olives or sliced sautéed mushrooms or zucchini can be added to the basic tomato basil sauce before mixing it with pasta. The taste and flavours of the tomato basil sauce depend on the quality of the tomatoes and olive oil used, as well as the slow cooking of the sauce. When you use fresh juicy tomatoes and cook the sauce down as in the instructions, making sure you stir it frequently and watch it so it does not catch or brown, you don’t need a lot of ingredients to make a tasty sauce. In fact, less is more in this case. Once the tomato sauce is all ready, either freshly prepared or in the fridge, dinner takes just 15 minutes – cook the pasta, and meanwhile sauté simple sliced zucchini or mushroom, add the tomato basil sauce and warm it up gently. Toss the pasta into the sauce and grate a little cheese on it – and there you are! Dinner fit for a king, with very little effort and with all the goodness of a homemade sauce. This Black Rice Salad has to be the most fun salad I’ve made so far. 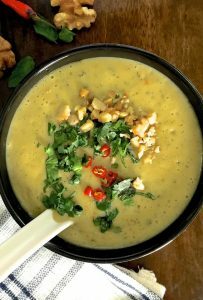 If you’ve been following my blog, you will know that I use several ingredients in each recipe, to bring together a variety of textures, flavours and colours into one (mostly) healthy package. 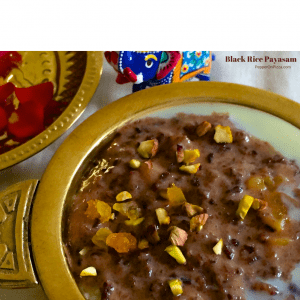 So when I received a sample of Heirloom Black Rice from First Agro Farms, I wanted to showcase this intriguing grain and bring out its goodness, and at the same time to have the medley of taste and texture that I’m so fond of in all my recipes. You may ask, what is intriguing about Rice? We in India have rice as a staple and use it in every possible way, so what’s new? Well, Black Rice is new, at least to me. The colour, the texture, the taste, the aroma when its bubbling on the stove…. A little time spent on the net gives interesting information: that Black Rice was first cultivated in China, some Ten thousand years ago, and for hundreds of years was reserved solely for the culinary pleasure of Chinese Royalty and noblemen: hence the name of Forbidden Rice or Emperors Rice, as its consumption was not permitted for the common people. The Rice was grown in limited quantities and the distribution carefully controlled. 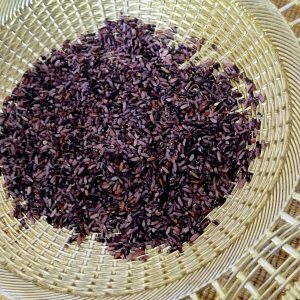 Black rice may not be Black, it could be pinkish, brown, purple, grey, or shades in between. And of course, black! When cooked, some varieties may be glutinous and sticky, due to high levels of amylopectin ( a major component of starch, and made up of glucose units). The black colouring is due the presence of large amounts of anthocyanin, which is what makes for colourful purple grapes, blueberries, aubergine .. You get the picture? Perhaps these ancient Chinese Emperors knew a thing or two: that this Black rice that they reserved for themselves, was considered highly nutritious, fabled to increase both health and longevity, and in fact called ‘tribute rice’ or ‘longevity rice’ during the Ming Dynasty. In India this rice is mostly grown in Manipur, and is available in some gourmet stores and on online stores, and if, like me, you are lucky enough to live in Bangalore, then you can get the Zero pesticide, non-GMO variety from First Agro Farms . 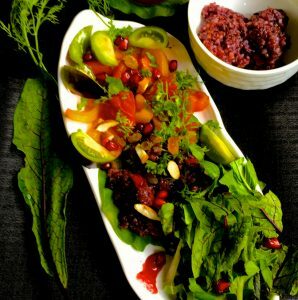 I’m planning a number of recipes using Black Rice, it is tasty, healthy and different! Like I always say, do check with your doctor for the individual suitability or otherwise of consuming any of these items, however ‘healthy’ they are said to be, specially when being treated for any illness. And not to forget the Cranberry Orange dressing, which I adapted from ‘Oh She Glows‘ Blog. Cranberries, Apple Cider Vinegar, Maple sugar, Fresh Orange juice, each with its nutrient benefits. 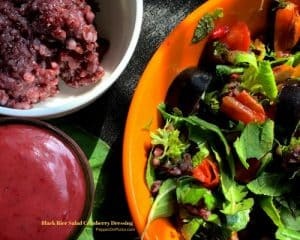 Now to stop sounding like my Biology text book and to get back to cooking the Black Rice and dishing up this Black Rice salad. The quantities listed here are indicative, you could adjust the ingredients to your taste while making the Dressing. For the Black Rice Salad, I used gorgeous Black cherry tomatoes (which are green when you slice them), Red tomatoes, Yellow peppers, Bok Choy, Sorrel and a variety of herbs. Any other greens could be substituted. And you could use pine nuts or walnuts instead of the almonds. I dry the salad greens and herbs in a salad spinner. If you make salads frequently, it would be good to invest in a sturdy salad spinner which lasts for some years. I use an Ikea salad spinner and its been value for money. Its amazing how much water is shaken off the leaves of lettuces and other greens, and my salads are now not soggy at all when I add the greens. peruvian kiwicha amaranth salad with buttermilk dressing. This Fennel Frond Pesto Pasta is now on my go to list of quick dinners to put together. It actually took less than 15 minutes from start to finish! 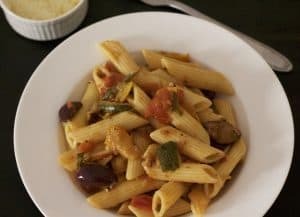 Of course the pasta was a quick cooking one, and the home made pesto was already available, but still its lovely to be able to put together a delicious meal with such little effort! Making the pesto would have taken another 10 minutes or so.